Love Books - Yes we love books! Welcome to Love Books, where books are our passion. We offer a tightly curated, well-edited range of classy books that make book buying an exciting and inspiring experience. Pop in and chat to our friendly, helpful and passionately bookie staff. Wednesday 3 April 6:00 for 6:30 pm - Local literary wunderkind Hayley Chewins launches her internationally published debut novel for young adults, The Turnaway Girls. Bring the teens. Thursday 4 April 6:00 for 6:30 pm - Remaining in the province of the youth, we launch 20-year old millennial Saskia Bailey’s 21st-century memoir, Whatever. She’s chatting to 5fm’s Nick Hamman. Tuesday 9 April 6:00 for 6:30 pm - Harry Kalmer and Hannelie Coetzee launch their limited edition handmade book die agste plaag. Thursday 11 April 6:00 for 6:30 pm - Don’t miss the launch of Fiona Snyckers’ latest novel, Lacuna, a brilliant response to JM Coetzee’s Disgrace. Chatting to poet and book lover Lorraine Sithole. Tuesday 16 April - 6:00 for 6:30 pm Harry Kalmer chats to Trevor Sacks about his stunning debut novel Lucky Packet. Tuesday 17 April - Hlumelo Biko launches his new book, Africa Reimagined. Tuesday 23 April - International best-selling author Mitch Albom at Love Books. Our launches are supported by Joostenberg, delicious organic wines from the family estate in Stellenbosch. Please note that all titles are subject to availability and we are happy to order anything that might be out of stock. Stuck in traffic on De Waal drive, Cape Town, Christopher Hope parks his car and walks up to the UCT campus to see what’s causing the trouble. He encounters an angry crowd pulling down the Rhodes statue - the chaotic culmination of the RhodesMustFall movement. What follows is a thoughtful road trip around South Africa’s cities and towns, their statues and memorials. An absolutely brilliant dissection of South Africa in the post-Mandela era. Magnificent and highly recommended. Sarah Wilson is best known for her I Quit Sugar cookbooks, so this book on anxiety from a high-functioning, super-successful human being comes as a surprise. But for those living with anxiety(all of us?) this is the freshest, most inspiring, insightful book on the subject you could hope to find. Beautifully written, quirky and uplifting, Sarah asks if anxiety can be re-sewn as a thing of beauty – it really might change your world. Set in post-war England, this is the story of 14-year-old Nathaniel and his sister Rachel, who are abandoned by their parents and left in the care of an enigmatic figure known as The Moth. But things are not what they seem, and soon we find ourselves in a thrilling novel of adventure, intrigue and desire. Loose yourself in Ondaatje’s achingly beautiful prose. After a drunken one-night stand with a student, followed by a terrible confrontation, academic Tertius de Klerk flees to Patagonia to the remote region where his Afrikaner forebears started anew after the Anglo-Boer War. Epic, poetic and soulful, this is an engrossing read based in this real-life Afrikaans community that exists to this day in South America. Available in Afrikaans as Patagonie. 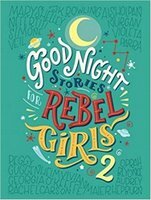 For children of all ages, the follow up to the international bestseller, Goodnight Stories for Rebel Girls, is a stunning collection of one hundred bedtime stories that celebrate extraordinary women. From queens and activists to ballerinas and lawyers, there’s something in here for everyone.